Cut through grease and grime to leave your dishes sparkling with Ecover Dishwashing Liquid. Ingredients: water (aqua), sodium lauryl sulfate, lauryl/myristyl glucoside, ethanol, sodium chloride, glycerin, sodium citrate, citric acid. Excellent soap! Sudsy and cleans well. I have used a few dish soaps designated as "fragrance-free" that smell weird. This one doesn't! It's amazing all-around. Iâ€™m allergic to perfumes so this product saved my life. Have repurchased this soap multiple times, it's the best fragrance free non toxic dish soap I've tried! Sudsy and concentrated. I wish they sold it in a much larger size, but for now will continue purchasing this size. If you prefer a scented soap, their Lime soap is great too. After trying several more natural and skin friendly and fragrance free dishwashing liquids, we have found our favourite one! I like that this one has absolutely no scent, lathers well and gets the dishes cleaned well without needing to use too much product. Bien cotÃ© par EWG, dÃ©graisse trÃ¨s bien. Une excellente alternative! Well rated by the EWG, it cuts grease very well. An excellent alternative to regular dish soap. This soap makes suds very well compared to other natural options I've tried. It cleans well, and has a great EWG rating. Definitely will be buying again. I have tried several natural dish soaps. This soap has the best rating on EWG and works great. I use this soap or castile soap for my home. Have repurchased several times. I like using this soap to clean anything plastic and baby bottles as it doesn't leave a perfumey scent behind. The only dish detergent I use now. My husband has really sensitive skin and he finds that this does not bother his hands. Works up a great lather, cuts grease, and is rated really well on EWG. last bottles I bought are very watery and does not sod enough. the first time I used the product , that was perfect. The last time I bought it , It is so watery that I cannot use it in the soap pump. something has changed in it and I do not like the new one. I have been using this dish soap for over a year and I love it. It has no smell and is very gentle. It does abgreat job cleaning dishes without irritating my skin. I love using this unscented soap for cleaning baby bottles and sippy cups. Lathers well and does the job. I love this dish soap. Cleans dishes well and has no strong perfume scent. Natural ingredients !!! 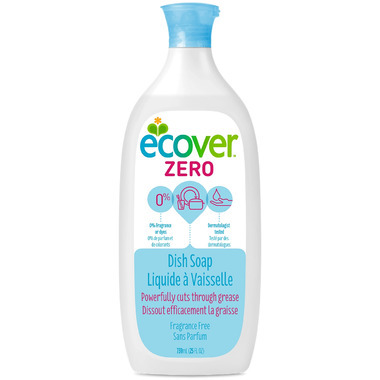 This is BY FAR the best Eco dish soap that I have found! I'm so glad that I can find this on Well.ca, and at such a great price!